This is the 19.5#, high quality, stock looking hood, some of you have said you wanted. They are made by a Cumberland Maryland Company, Class Glass & Performance, that has been building high quality automotive parts since 1990. They are available, through me, or suby-crosser, for $350.00, in black gel coat. There are more pictures in my locker. Last edited by svxfiles; 10-26-2006 at 01:19 PM. I got to see the hood on Tom's Pearlie over the weekend at the Subaru Challenge. Very nice quality and fit There will be one on the racer when we can come up with the funding. Do you have me down for s/n 002 or 003? Please put me down for s/n 002 AND 003? That would make quite a statement. Last edited by svxfiles; 09-19-2005 at 02:50 PM. what about the window washer nozzles? Life is a game. Play to win. The world belongs to those who can laugh at it. I got to see the hood on Tom's Pearlie over the weekend at the Subaru Challenge. Very nice quality and fit There will be one on the racer when WE CAN COME UP WITH A SPONSOR WILLING TO PAY FOR IT. Fixed your post. My 2cents are it is a VERY GOOD product. Does not need painted as the finish is very good from factory. Its light as can be but it also has some strength to it. It doesn't bend in 2 when you hold it up like some of the hoods I saw at the challenge on various imprezas. Worth every penny!! I am going to put mine on the W.W. arms using GM nozzels,for a more streamlined look. I run my nozzels on the wiper arms. But, but, Bill,,,, THATS HOW GM DOES IT!!!! So we got any hard numbers on how much weight this puppy saves? 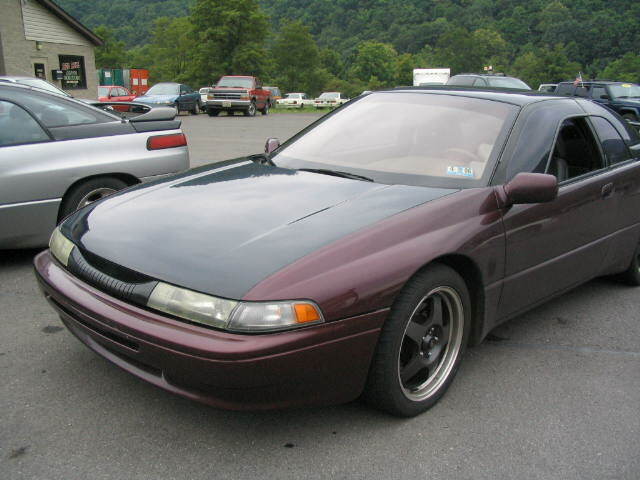 92 SVX #772 140k 6speed, ECU Tune stage II, Koni/Ground control, 3,270lbs. 91 Legacy Turbo 5spd. FMIC, crappy stock turbo, ACT clutch. To many cars to spend time on teh web! When I weighed my spare stock hood I got 48#s on my digital scale, before I gutted it down to 37#s by removing the underhood bracing. Making it shake, flap, flex, and sound like a Cavalier hood. The new street weight hood, like the one on my car weighs, (according to Class Glass) 19.5#s! When I get the chance I'll bring my digital scale down to them and weigh my old Claret hood and the next street weight black fiberglass one. 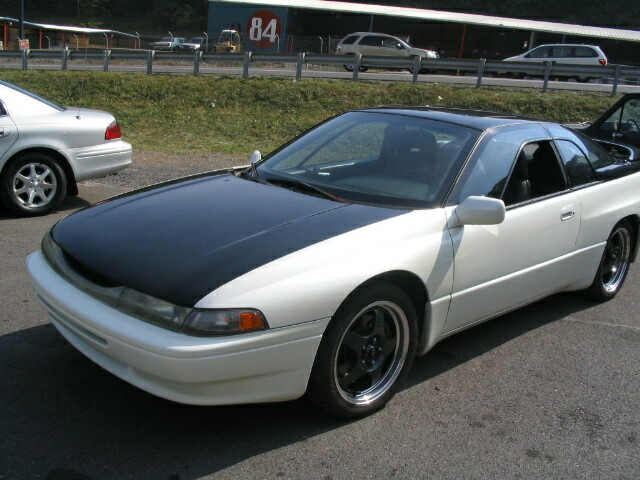 The street weight hood has TWO layers of 2oz fiberglass for the hood surface, and TWO layers to make the underhood bracing, and 4 layers where the "nutzerts" go. BTW, a single layer lift off race weight one will weigh about 10-11#s. The race weight hood will have one layer of 2oz fiberglass, and 1 layer of 6oz backing where the MANDATORY hood pins go. Last edited by svxfiles; 09-21-2005 at 08:14 AM.